You might be surprised but the most commonly used AutoCAD command is neither LINE, CIRCLE nor DIM, but the ERASE command. And the most frequently used command sequence is ERASE-MOVE-COPY. This is the result of the analysis performed by Autodesk on the data sent by AutoCAD users who are taking part in the CIP program (Customer Involvement Program). It looks like CAD users are rather erasing than creating designs. But the true reason for this surprising winner is probably that CAD users are usually trying different scenarios, drawing and playing with their designs and then erasing again most of the variants. And the common command - ERASE - then jumps in the command statistics. The data may be also distorted by the fact that not all users enable the CIP program to send out their statistics data online (the CUSTOMERINVOLVEMENTPROGRAM command). CIP is probably more used by beginners and "testing" users. The full results of the command analysis - not only for AutoCAD but also for Revit, Inventor and 3ds max - are available in the post Autodesk Research on Command Usage from CIP Data on the "Between the Lines" blog. For respective command names in your AutoCAD language use the AutoCAD command dictionary. 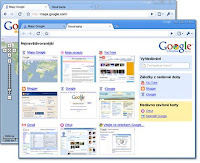 Google just released their own, new, fast and open internet browser "Google Chrome". This application - despite it is only a beta version and only for Windows - can substantially change the internet browser market. Well, "market" is probably not the right term here, as most browsers are free software, but in any case, the dominance of Microsoft Internet Explorer and still growing share of Firefox may be soon in danger.